This weekend was the first time I’ve ever attended a political convention, so I was quite happy that I was able to represent my riding as the youth representative (which came with a discounted admission). I wasn’t the first convention-virgin there, although a couple people in attendance had attended the first BC NDP convention back in 1961. 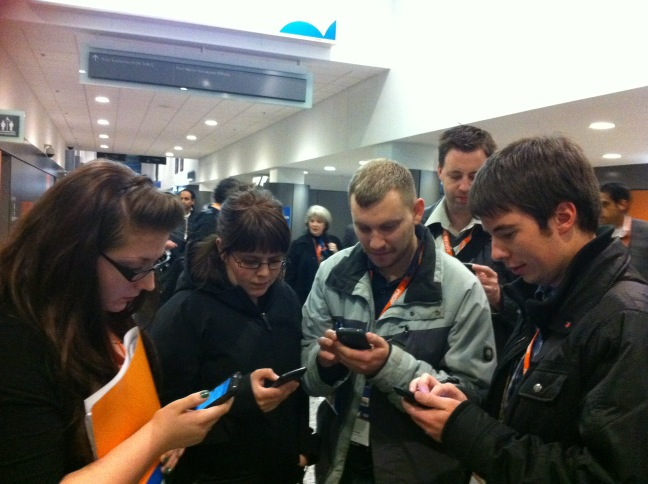 You can read my play-by-play thoughts on my Twitter stream under #bcndp50. 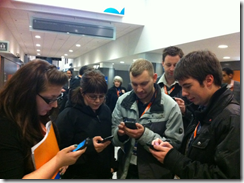 I can be seen tweeting from the convention #tweetup at the right of the picture. I won’t give a report on everything that went down, but I’ll offer some observations on the key themes that arose between Friday evening and Sunday afternoon. The BC NDP leadership, including party leader Adrian Dix and the party executive, tried – and generally succeeded – at presenting the BC NDP as a united force after the bitter divisions that led to the resignation of Carole James last year. The (few) resolutions that were debated were nearly all accepted unanimously and the only opposition came from those who wanted to see some measures go farther. The federal leadership town-hall was similarly presented in a non-confrontational way, with questions being asked to three candidates at a time with no inter-candidate sparring. Even the phenomenal keynote speaker (and former Obama advisor) Van Jones (pictured on right) emphasized the need to keep supporting our progressive parties even after they win. He was disappointed that progressives haven’t been as organized as the Tea Party activists in the USA (until the Occupy movement). This unity theme was most apparent in the party executive elections acclamations. Under rules that are somewhat obscure, the nominees were registered prior to convention as the Unity slate, and no nominations were held from the floor. Things are going well though, so the otherwise contrarian members of the party stayed seated. The success of the unity theme was clearly demonstrated when members voted 98% against holding a leadership election next year. Less than 2% of members opposed Adrian Dix’s leadership. This is a good sign going into the 2013 election. to review the program after the 2013 election. Several men and women stood to oppose the quota system, preferring more outreach rather than direct affirmative action. The report even anticipates these concerns and offers an essay by Swedish Political Science professor Drude Dahlerup and also summarizes some pros and cons for quotas (but ironically gives twice as many cons as pros). In the end, there were at least twice as many people standing to speak in favour as against, and when the vote was called, a large majority (likely greater than 2/3s by my estimate) supported the recommendations. I personally voted in favour because while one speaker argued that such a system may have prevented leaders like Jack Layton or former BC NDP premier Dave Barrett from participating, without action to bring equitable representation to our democracy, we will never know what amazing women’s voices have been silenced by systemic sexism. The theme of the convention was the 50th anniversary, so it was natural for a large focus to be on the history of the BC NDP. 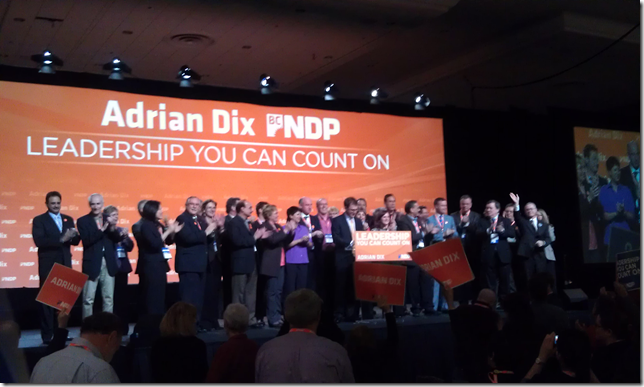 Adrian Dix’s speech was based on past leaders speaking to the convention and a 50-year tribute recognized the highlights of the history of the party. Notable omissions included past leaders Bob Skelly, Dan Miller, and Ujjal Dosanjh. But it was a celebration, so you can forgive a party that’s celebrating being up 9 points over the Liberals. Former premier Glen Clark even dropped in during the tribute to give a brief recollection. There was a YND 50s themed party and a 50th Celebration on Friday and Saturday nights respectively, but I missed them both after having a late night after my successful thesis defense on Thursday. Friday kicked off with a panel discussion on NDP electoral success with representatives from the Nova Scotia, Manitoba, and Ontario NDP. Despite their recent elections, I guess the Saskatchewan and Yukon NDP weren’t invited (or couldn’t make it). The representative from Manitoba had a slightly different message about how they had to frame change as risky since they were pursuing their fourth consecutive majority government, while Ontario and Nova Scotia pushed positive change messages. Each emphasized the need to research and identify messaging to reach out to voters in specific target ridings. Despite this advice, Adrian Dix promised to pursue an 85-seat strategy in 2013. Nycole Turmel (pictured) gave the main keynote this morning. Based on the number of standing ovations, it was one of the less riveting speeches. All nine candidates for the federal leadership of the NDP were also in town and attended a town hall on Saturday afternoon. I’ll save my discussions of that for a follow-up post though. The NDP can be a mixed bag when it comes to science, but it remains better than the Green Party. On the plus side, recently re-elected Vancouver City Councillor and biologist Heather Deal earned cheers when she talked about the need for science in the BC NDP environment policy and MLA John Horgan called for a science based approach to fracking. It was less promising to see science and evidence missing from the policy principles designed to guide policy development into 2013. Similarly, the pillar of the BC NDP’s environmental policy Sustainable BC includes a reference to the precautionary principle but also omits science and reason. I was also disappointed to see a resolution complaining about potential health effects due to smart meters, but luckily it was too low in priority to make it to the floor. Finally, in the absurd category falls the Vancouver Medicinal Cannabis Dispensary who were advertising for snake oil at their booth. Checking their website, Snake Oil is $65 for 10mL and is “Quadruple strength Hugz Hemp Oil. Good for absolutely EVERYTHING! Contains 80 mg/ml Honey Oil.” It’s listed under Elixirs. Fresh off their own successful civic election Vision Vancouver had a strong presence at the conference. Mayor Gregor Robertson gave one of the opening speeches and I was lucky enough to meet councillors Heather Deal (who hung out at our Point Grey table when she could) and Geoff Meggs. They both also hung out at Niki Ashton’s “pub” night for a bit. It was great talking with Heather about the need for more science and more scientists in politics. 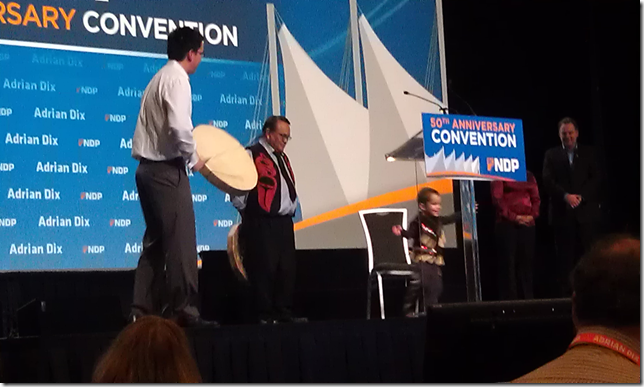 The cutest moment happened early on when Musequeam representative Wade Grant’s son kicked off the convention with an animal dance (pictured). Thanks. Very similar criticisms were laid against the BC NDP leadership race earlier this year. The entire affair was marked by cordiality and agreement over key priorities with subtle differences in emphasis. This was important because the party had been tearing itself apart just a few month prior before Carole James stepped down as leader. Similarly, most of the people who lose this race will still have to work with whoever wins. It does little service to the party or individual’s future successes to go to vigorously on the attack. Subtle jabs here and there, but nothing obvious or vindictive.